2 cups water, 1 cup sugar, 2 blood oranges, thinly sliced, 1 cup shelled pistachios, ½ cup unsalted butter cut into pieces, ½ cup sugar, 1 teaspoon grated orange rind, Pinch salt, 2 eggs beaten, 1 pre-baked 9-inch tart shell, 1 tablespoon coarsely chopped pistachios. Place water and sugar in a wide pot over high heat and bring to a boil, stirring to dissolve sugar. Reduce heat to medium-low, add orange slices and simmer, turning oranges occasionally, for 40 to 45 minutes or until oranges are soft and peel is beginning to look translucent. Transfer slices to a rack to cool, reserving syrup for glaze. If syrup is too thin, boil down until it thickens. Preheat oven to 375F. Combine pistachios and butter in a food processor. Sprinkle in sugar and orange rind and pulse until mixture is combined. Add salt and eggs and process until incorporated. Spread mixture in pre-baked tart shell and bake 25 to 30 minutes (covering the edge of the pastry with foil if it begins to get too browned), or until filling is puffed and browned. Cool. Fan orange slices decoratively over top of tart and brush with orange glaze. Sprinkle with chopped pistachios. This was an unusually pretty dessert. I found that I used up four oranges instead of two. Another comment is that the filling was not great and next time, I will make the blood orange tart with the filling of my peach tart, (hazelnut vs pistachios and minor adjustments). I might still have the pistachio sprinkle on top of the oranges because the colours compliment each other. 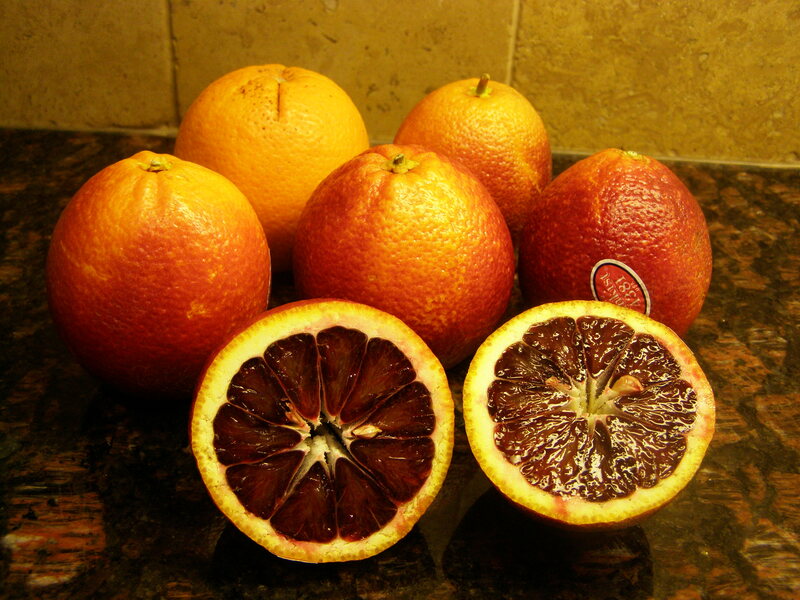 Blood oranges have a short season which is running out soon, so go find them quickly and enjoy! The tart was a bit awkward to cut and one of my guest suggested using “mini” pie shells and I think that ‘s a much better idea! On the 2nd attempt, the Peach tart filing worked out much better, ( 1 egg, 1/4 cup honey, 1/4 cup butter, and 1/4 cup ground hazelnuts. Still sprinkled pistachio bits on the oranges and a tester commented that pistachios and blood oranges both grow in Sicily, so a natural association, you could say. Next, will try adding some Dark French chocolate, maybe for Christmas. 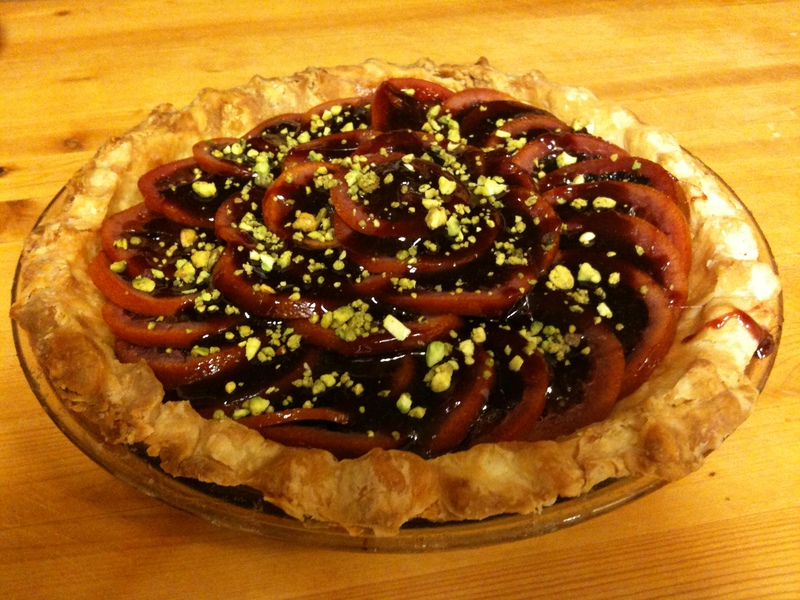 This entry was posted in Baking, Dessert and tagged blood orange, blood orange tart, food, pistachio, recipes. Bookmark the permalink. That looks incredible. I love the pistachios on top!